Hot off the presses in the second issue of the 2017 volume (page 472-473), The Herpetological Art of Robert Cyril Stebbins looks back at the life and career of a man whose contributions to the field of herpetology are still not only celebrated, but put to work on a daily basis as biologists young and old pick up their copy of Stebbins’ field guide, A Field Guide to Western Reptiles and Amphibians, and thumb through the pages to identify this or that lizard, check a species’ range, or compare a specimen to the carefully illustrated plates within. In the process of preparing this piece, I had the opportunity to handle Dr. Stebbins field notebooks and original intricate illustrations at the Museum of Vertebrate Zoology and Bancroft Library, and had the pleasure of speaking with Professor Emeritus David B. Wake, former Director and Curator of Herpetology at the Museum of Vertebrate Zoology, and Theodore Papenfuss, research specialist at the Museum of Vertebrate Zoology, about their experience working alongside this venerable herpetologist. But nothing says more about Dr. Stebbins’ passion for herpetology than his artwork. Full Citation: Bettelheim, Matthew P. 2017. Art in Herpetology: The Herpetological Art of Robert Cyril Stebbins. Herpetological Review 48(2): p 472-473. March 31st is California’s esteemed herpetologist Dr. Robert C. Stebbins‘ birthday. 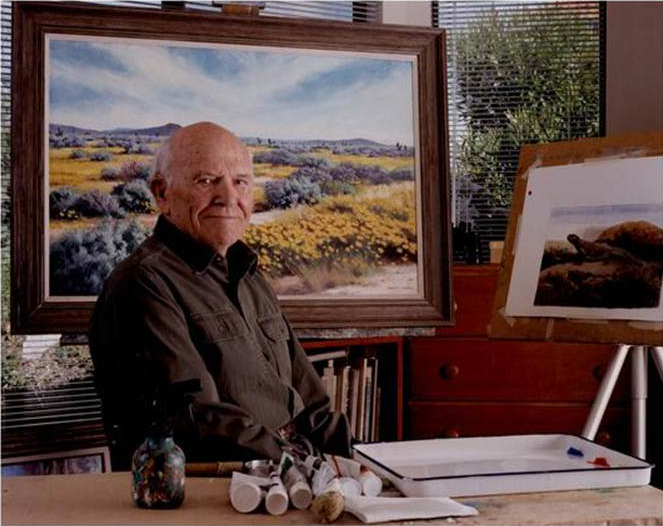 Dr. Stebbins passed away last year on September 23, 2013, at the age of 98. Whether you knew him in person or were an admirer from afar – even if only through the pages of his trusty field guides – this is as good a time as any to remember him not only for his great accomplishments, but also his kindness. On September 23, esteemed herpetologist Dr. Robert (“Bob”) Cyril Stebbins (March 31, 1915 – September 23, 2013) passed away in his sleep at the age of 98. In the days since his passing, articles and obituaries have sprung up across the county commemorating Dr. Stebbins not only for his great accomplishments, but also his kindness. Three new obituaries from the New York Times, LA Times, and SF Gate are listed below for those interested in learning more about one of California’s finest environmental heroes. For those of you who wish to share your thoughts, memories, and reflections of time spend with Dr. Stebbins as a friend, student, or colleague, or as a naturalist in the great outdoors with his field guides in hand, I encourage you to visit this earlier post, In Memorium: Robert C. Stebbins (March 31, 1915 – September 23, 2013), and record a note in the “Comments” to share your love and respect for the late Dr. Stebbins with the herpetological community. In the Spring of 2012, the Stebbins family granted me permission to reprint extracts from his memoir, a work-in-progress he offered freely to the herpetological community. For more information on this serial column featuring the life and times of Dr. Robert C. Stebbins, please visit this post. On September 23, esteemed herpetologist Dr. Robert (“Bob”) Cyril Stebbins (March 31, 1915 – September 23, 2013) passed away in his sleep at the age of 98. In the days since his passing, articles and obituaries have sprung up across the county commemorating Dr. Stebbins not only for his great accomplishments, but also his kindness. An *updated* list of sites is listed below for those interested in learning more about one of California’s finest environmental heroes, including the Stebbins family’s formal obituary published in the Eugene Register-Guard on September 26, 2013. You are currently browsing the archives for the Stebbins category.